Description Bibliophiles, grab your glasses! 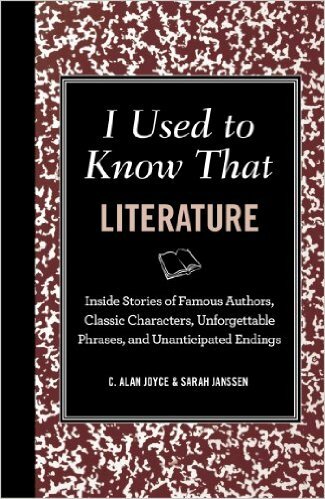 Here is a compendium of interesting- and often scandalous-facts and quips about the literary world. Featuring authors and tomes of yesteryear and yesterday, from Tolkien's Middle-earth to Jeffrey Eugenides's Middlesex, I Used to Knew That: Literature includes sections such as: You Don't Say: Commonly-used words and phrases that were coined or popularized in classic words of fiction-sometimes with very different meanings. Gruesomely Ever After: The original endings of some of the world's most cherished fairy tales-Snow White, The Little Mermaid, Cinderella, and more. Hip to be Square: Banned works of fiction and the controversy surrounding them. Anthropomorphized Characters: The real-life stories and inspirations behind beloved "leading creatures." Time to Make the Doughnuts: Odd jobs of famous authors. Parental Guidance Suggested: Dahl's short stories, Seuss's political cartoons; the lesser-known, and sometimes shocking, adult writings of beloved children's authors. The Long Con: Shocking (and sometimes shockingly long-lived) literary hoaxes: Frey, JT Leroy, The Education of Little Tree, The Day After Roswell, etc. Science Fiction, Science Fact: If alien monoliths are ever found on the moon, the safer bet is that they would be translucent crystal; Sir Arthur C. Clarke is celebrated for making accurate predictions of various technologies, years ahead of their time. A look at which of his predictions held true and the same feats of other authors. Screen Test: The truth about great works of fiction and the odd challenges that had to be surmounted to bring them to the silver screen. The Secret Life of Kilgore Trout: True facts about fake characters (and the writers who created them).